There is a lot to do in the area of “De Kandelaar”. We have put together some packages for you together. Of course, these packages can be adjusted to your wishes. Arrival, introduction to “De Kandelaar“ (Candlestick) and check-in. Visit the Nieuwe Land Museum and see how the polder was created by human hands and what life was like for the first inhabitants of the youngest Dutch province. To finish the day, you can enjoy the regional cuisine at restaurant Flantuas. Visit the Oostvaardersplassen. Although much of the nature reserve is closed to the public, (so that nature can take its course without human interference) there are still parts that are accessible where you can admire all the flora and fauna. There is a visitors centre where experts give information on where to go, what to do and what you can find. Following a visit we recommend dinner at restaurant Moellies of De Rede in Dronten. Day of departure, but before you go you can enjoy a good breakfast. Flevoland Package price: € 118.50 per adult (based on 2 persons), 3 nights accommodation including breakfast. Day 1: Arrival, introduction to “De Kandelaar” and check in. Day 2: After breakfast you will visit Walibi Holland. Day 3: Well prepared on your way! Book a skid course at the test center of the ANWB, check www.anwb.nl for more information. This test cebter is located only 8 km from De Kandelaar. Or be impressed by everything that flies in the air, then visit Aviodrome (also within 8 km). Watch the oldest aircraft or take a look in the cockpit of a Boeing. The true lovers even can book a flight there. Check out the sleek straight lines of the polder landscape from the air, more info on www.aviodrome.nl. Day 4: Day of departure. Naturally, we conclude with a good breakfast before starting the journey home. Would you like to book this Active Package, please contact us. Day 1: Arrival, introduction to “De Kandelaar” and check in. Of course you can take a look at the cows, sheep and goats, and maybe there are also some kittens to admire. Day 2: After breakfast you will visit the Dolphinarium. Day 3: Visit the Lelystad nature park. Here you can rent a bike or take a nice walk. It is amazing how many animals you’ll find here. When the children still have left any energy, then visit the pancake house ‘Hans & Grietje’. Here kids can play in the candy house, jump on the trampoline or enjoy a round of racing on the Go-kart track. And of course, to finish with a delicious pancake. Day 4: Day of departure. Naturally, we conclude with a good breakfast. Would you like to book this Kids Fun Package, please contact us. Relax at ‘De Kandelaar’. Enjoy two nights of the wide polder landscape and wake up with delicious, full breakfast. To relax completely, we recommend you make a visit to ‘Sabilon’ beauty salon, a small lounge just steps away from the Bed & Breakfast. More information is available at Sabilon. If you like the sauna, then visit ‘Aphrodite’s Thermen’ in Dronten. This little pampering resort has a relaxing sauna and a small swimming pool. Look for opportunities at Aphrodite’s Thermen website. And to complement your visit to Dronten we recommend dining at restaurant ‘restaurant Moellies’ or restaurant ‘De Rede van Dronten’. Price for 2 nights and breakfast € 79.00 per person (based on 2 persons). Would you like to book this Relax Package, please contact us. Every spring the polder landscape colours beautifully due to the many tulip fields. In cooperation with Tulpenroute Flevoland, various hiking, cycling and car routes are set out in Flevoland. Come and enjoy the beautiful spring from mid-April to early May. Introduction to “De Kandelaar”. You can enjoy a smooth check in and of course take selfies in the tulip fields at our farm. Day 2: After an extensive continental breakfast you can follow the car or cycle route. If you prefer to take the route by bike, but you do not have one, we have bikes available for renting. Day 3: Day of departure. You can again relish a final time with the extensive continental breakfast that morning and you will receive a bouquet of tulips to enjoy the tulip splendour a little bit longer! 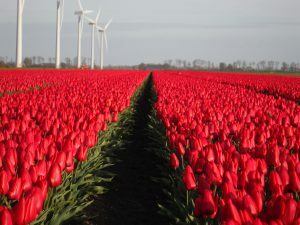 Would you like to book this Tulip Package, please contact us. During the Whitsun weekend the Walibi Holland terrain organized the conference ‘De Opwekking’. A major event with over 50,000 visitors. Come and stay at De Kandelaar. Enjoy a moment of calm before going back to the many visitors. After a restful night and a wonderful breakfast you can enjoy all the activities at ‘De Opwekking’. The event can be reached by car within 15 minutes. Book early because space is limited. Book 3 nights (Friday to Whit Monday) for € 270.00 per room, which includes bed linen, towels, tourist tax, breakfast and lunch. Room 4 (family room) has space for four additional people, €125,00 for each additional person.